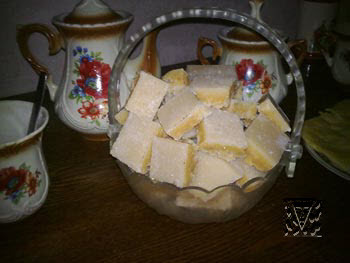 Often in the Tatar houses for tea give a very fragrant sweet fondant - tatly. Prepare her adding to the hot boiled milk sugar and well stiring up cook about 20-30. If to put a tea-spoon turning out the masses in cold water and a strong marble appears from her, so, a dish is ready. A prepared fondant has a biscuit-colour. The prepared mass is poured on a ferrous sheet or frying pan by a layer in 2 sm. When the fondant has set, cut figurines in form rhombus, square, triangle and so on. To tea give in a sugar-bowl. It is possible to add for an aroma and taste of 10-15% from the taken sugar, honey. For this purpose honey it is needed to warm up and add since sugar will begin to boil with milk. on 1 kg sugar (lump sugar) - 350 g milk. For prepare real Tatar tatly is used only natural berries of raspberry, strawberries, strawberries etc. The Fresh berries we sort out, wash, shift in a gauze sac and wring out by hands. In the got baccate juice add granulated sugar and mix. At eggs we separate albumens and beat up. Further we infuse into egg white baccate juice and once again mix. The prepared mass we shift in a frying pan, smeared by oil. We warm up a flag to 180 degrees and we put a frying pan in an oven on 10 minutes. Tatly in an oven raised appreciably. When a top will be brown - we take out, cool, cut with rhombuses and serve up.